The ultimate goal of experimental efforts within the area of inelastic collision processes is to be able to measure state-to-state cross sections or rate constants. So far this has been possible only for a few systems of mainly hydrogen-containing molecules and only for rotational excitation among the lower-lying levels of these molecules. 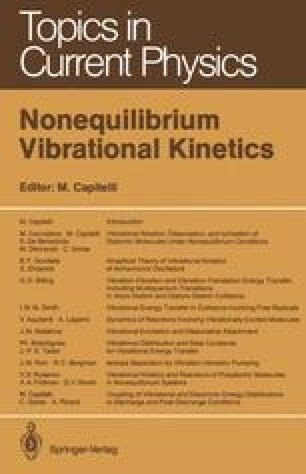 For excited systems and for vibrational-excitation cross sections we still have to extract the information from experiments which require modeling of the underlying kinetics. Thus a large number of rate constants are usually involved and have to be estimated one way or another. It is therefore necessary, in order to extract meaningful information from the experimental data, to have reliable guidelines from theory of, e.g., the magnitude of rates included or eventually omitted in the modeling, scaling laws, etc. Once a series of rates have been determined by this interaction between theory and experiment it is, of course, possible to use these in numerical simulations of this or other experiments under conditions which are difficult or even impossible to handle experimentally at the moment. Usually it is also much easier to change “experimental” conditions in a simulation program than in the real experiment, which in turn makes it easy to scan a large area of conditions so as to find those which are considered interesting and therefore worth investigating in the laboratory.